It is nearly impossible to traverse web news or popular media today without being assaulted by vast amounts of propaganda on Artificial Intelligence (AI). It is perhaps the fad to end all fads as it supposedly encompasses almost every aspect of human existence, from economics and security to philosophy and art. According to mainstream claims, AI can do almost everything and do it better than any human being. And, the things AI can’t do, it WILL be able to do eventually. Whenever the establishment attempts to saturate the media with a particular narrative, it is usually with the intent to manipulate public perception in a way that produces self fulfilling prophecy. In other words, they hope to shape reality by telling a particular lie so often it becomes accepted by the masses over time as fact. They do this with the idea of globalism as inevitable, with the junk science of climate change as “undeniable” and they do it with AI as a technological necessity. The globalists have long held AI as a kind of holy grail in centralization technology. The United Nations has adopted numerous positions and even summits on the issue, including the “AI For Good” summit in Geneva. The UN insinuates that its primary interest in AI is in regulation or observation of how it is exploited, but the UN also has clear goals to use AI to its advantage. The use of AI as a means to monitor mass data to better institute “sustainable development” is written clearly in the UN’s agenda. The main source for the development of AI has long been DARPA. The military and globalist think tank dumps billions of dollars into the technology, making AI the underlying focus of most of DARPA’s work. AI is not only on the globalist’s radar; they are essentially spearheading the creation and promotion of it. The globalist desire for the technology is not as simple as some might assume, however. They have strategic reasons, but also religious reasons for placing AI on an ideological pedestal. But first I suppose we should tackle the obvious. In most white papers written by globalist institutions on AI, the thrust centers on mass data collection and surveillance. The elites are careful to always assert that their interests focus on the public good. This is why the UN and other agencies argue that they should be the leaders in oversight of mass data collection. That is to say, they want us to believe that they are objective and trustworthy enough to manage rules for data surveillance, or, to manage the data itself. So, what we have here is yet another false paradigm in which globalist institutions are opposed to corporations in terms of how AI is used. Yet, globalist corporations and globalist institutions both develop AI as well as pro-AI sentiment. The public, with its innate distrust of corporate moral compass, is supposed to be convinced to support UN regulatory reforms as a counterbalance. But in reality, corporate powers have no intention of fighting against UN control, they will ultimately welcome it. The actual effectiveness of AI as a means to help humanity is questionable. AI is primarily about “learning algorithms”, or machines that are programmed to learn from experience. The problem is that a learning algorithm is only as effective as the human beings that program it in the first place. That is to say, learning is not always a cause and effect process. Sometimes, learning is a spontaneous epiphany. Learning is creative. And, in some cases, learning is inborn. When a machine is pitted against a human in a system built on very simple and concrete rules, machines tend to prevail. A chess game, for example, is designed around hard rules that never change. A pawn is always a pawn and always moves like a pawn; a knight always moves like a knight. While there can be moments of creativity in chess (which is why humans to this day are still on occasion able to beat computers at the game), the existence of the rules makes AI seem smarter than it is. Human systems and natural systems are far more complicated than chess, and the rules tend to change, sometimes without warning. As quantum physics often discovers, the only thing that is predictable when observing the universe and nature is that all things are unpredictable. How well would an algorithm do in a chess game where a pawn could suddenly evolve to move like a knight, without any specific predictable patterns? Not very well I suspect. And this is where we get into the crux of how the image of AI is being inflated into a kind of half-assed electronic god; a false prophet. AI is being inserted not only into chess, but into everything. Mass surveillance is impossible to manage by humans alone; the amount of sheer data is overwhelming. So, one core purpose of AI for the globalists becomes clear – AI is meant to streamline mass surveillance and automate it. AI is meant to scour social media or electronic mail for “key words” to identify potential miscreants and opposition. It is also meant to monitor public sentiment towards specific issues or governments. The goal is to gauge and eventually “predict” public behavior. This becomes more difficult when we start talking about individuals. While groups are more easily observed and mapped in their behavior, individuals can be abrupt, volatile and unpredictable. AI mapping of personal habits is also prominent today. It is more visible in the corporate world where marketing is tailored to individual consumer patterns and interests. That said, governments are also highly interested in tracking individual habits to the point of creating psychological profiles for every person on the planet if possible. This all boils down to the idea that AI will one day be able to identify criminals before they ever commit an actual crime. In other words, AI is meant to become an “all seeing eye” that not only monitors our behavior, but also reads our minds as a force for pre-crime identification. The question is not whether AI can actually tell us who is a future criminal. AI is obviously incapable of accurately predicting a person’s behavior to such a degree. The question is, WHO is setting the standards that AI is looking for when identifying potential “criminals”? Who gets to set the rules of the chess game? If an algorithm is programmed by a globalist, then AI will label anti-globalists as future or current criminals. AI does not truly think. AI does not enact the power of choice in its decisions. AI does as it is programmed to do. The globalist obsession with AI, however, goes far beyond centralization and control of populations. As noted above, there is a religious factor. In my recent article ‘Luciferianism: A Secular Look At A Destructive Belief System’, I outlined the root philosophy behind the globalist cult. The primary tenet of luciferianism is the idea (or delusion) that certain special people have the ability to become “gods”. But, there are some consequences of this belief that I did not explore in that article. First, in order to become a god, one would have to have total observational power. Meaning, you would have to be able to see all and know all. Such a goal is foolish, because observing everything does not necessarily mean a person knows everything. Total observation would require total objectivity. Bias blinds people to the truth right in front of their faces all the time, and globalists are some of the most biased and elitist people on the planet. Completely objective observation is impossible, at least, for humans and the algorithms they program. From physics to psychology, the observer always affects the observed and vice versa. That said, I think the globalists don’t really care about this reality. It is enough for them to pretend they are gods through mass surveillance. They aren’t actually interested in attaining godlike enlightenment or objectivity. Second, to become a god, in a mythological or biblical sense, one would be required to create intelligent life from nothing. I believe that in the minds of the luciferians the creation of AI is the creation of an intelligent life form, rather than software. Of course, luciferians have a disturbed notion of what constitutes “intelligent life”. As I examined in my article breaking down and debunking luciferian ideology, the existence of inherent psychological archetypes form the basis for the human ability to choose, or to be creative in their choices. The existence of inherent understanding of good and evil establishes the foundation of human conscience and moral compass – the “soul” if you will. Luciferians argue despite ample evidence that none of this actually exists. They argue that humans are blank slates – machines that are programmed by their environment. To understand this ideology or cult built on blank slate theory, we must consider the fact that globalists often exhibit the traits of narcissistic sociopaths. Full blown narcissistic sociopaths make up less than 1% of the total human population; they are people who actually lack any inherent empathy or the normal personality tools that we would associate with humanity. It would not be an exaggeration to say that such people are more like robots than people. I have also theorized that luciferianism is a religion designed by narcissistic sociopaths for narcissistic sociopaths. It is a kind of binding or organizing tool to gather sociopaths into an effective group for mutual benefit – A club of parasites. If this theory is true, then it represents something that is rarely if ever dealt with in mainstream psychological or anthropological observation; the existence of a cabal of narcissistic sociopaths conspiring together to hide their identities and to become more successful predators. To summarize, luciferianism is the perfect belief system for narcissistic sociopaths. They are, in a way, inhuman. They are blank slates devoid of humanity, and so they adopt a religion which treats this notion as “normal”. So, it makes sense that they would consider something as simple and empty as AI to be intelligent life. As long as it is able to be programmed to act “autonomously” (which they seem to consider sentience), their definition of intelligent life is fulfilled. There is nothing intelligent about artificial intelligence when it comes to moral or creative actions, but narcissistic sociopaths have no concept of this anyway. 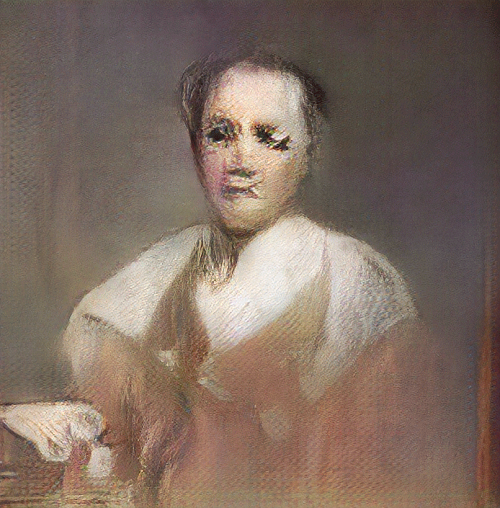 I leave readers with this to consider; last year an AI program was given the task of creating its own works of art. The outcome was highly publicized and some of the art was sold for over $400,000. I invite you to look at this artwork here if you have not seen it already. From what I have witnessed, the common human reaction to this “art” is for people to recoil in horror. It seems like a strange parroting of human elements of art, but with none of the soul. Intuitively, we understand that AI is not life; but for globalists it is the very definition of life, probably because the soulessness of the creation is reflective of the soulessness of the creators. Just as Christians believe that mankind was made in the image of God, luciferians in their pursuit of godhood have created a “life form” that is perhaps ironically just like them.